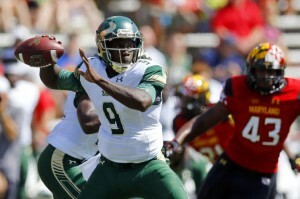 USF had problems at quarterback late in the Fourth Quarter helping the Terps to a 35-17 victory. After what could have been called one of the most disappointing losses in Terps history last week, this week Randy Edsall vowed for changes to his line-up and demeanor for the game for USF, well it worked as the Terps forced the Bulls into miscues late in the game helping them back on their feet with a much needed victory. With Caleb Rowe leading the way, the Terrapins overcame a variety of mistakes of their own on Saturday in a 35-17 victory over South Florida. Rowe was named the starting quarterback in the wake of a 21-point loss to Bowling Green last week. Despite mishandling the ball at times, the junior provided enough big plays on his 33 passes to help the Terrapins (2-1) finish with 411 yards in offense. South Florida (1-2) also had its share of miscues – including two turnovers, a dropped potential touchdown pass, a holding call that wiped out a touchdown run and a personal foul penalty that erased a fourth-quarter first down when the score was 28-17.